Scene of departure on the migration from Aztlan to what would be the founding of Mexico-Tenochtitlan. Codex Boturini. The people of Aztlan (whom we call the “Aztecs”) left their lake-island home in the year 1 Flint (indicated by the glyph in the square, calculated to be 1168 C.E.) to begin their historic migration, which would eventually culminate in the founding of Mexico -Tenochtitlan on another island in a lake. The latter was in central Mexico, occupied by the modern Mexico City. The location of the departure point, Aztlan, is unknown, but it is believed to have been to the north and/or the west. 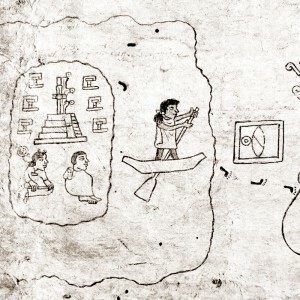 The detail we see above, from the Codex Boturini (also known as the Tira de la Peregrinación), shows footprints to indicate the path of the migration after the couple would reach the lakeshore. The fuller codex (screen-folded amatl) encompasses other stops along the path, and the journey would take many years, for legend has it that the capital city was founded in the fourteenth century. 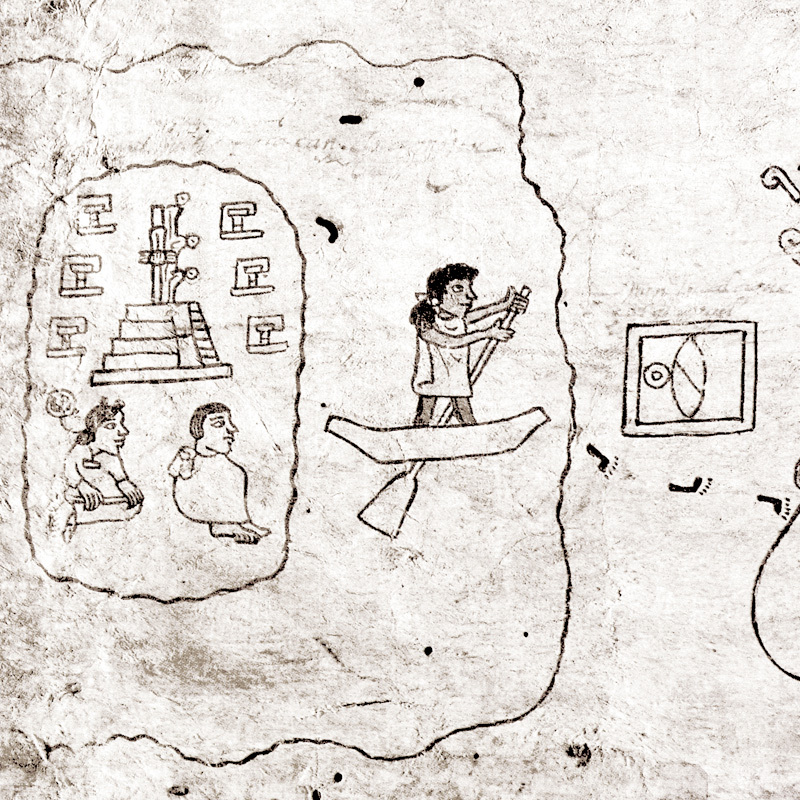 Below, we see a rendition of the lake around the Aztec capital as it might have looked at the time of contact (credit: Código Diez). These are indigenous-authored manuscripts made in Spanish colonial times but still with many pre-Columbian stylistics. 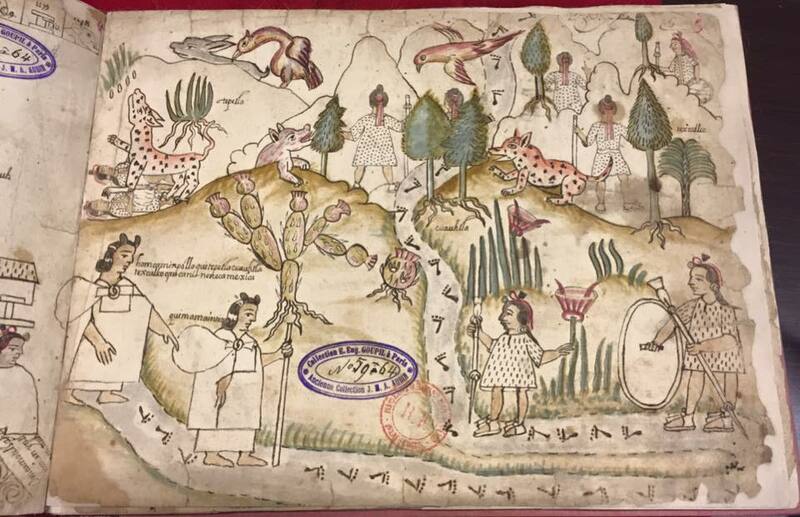 Below, we see a scene from the Codez Azcatitlan, which also tells of the legendary migration of the people of Aztlan. A free, full-text study of this codex, by the scholar Federico Navarrete, along with additional scenes (but only in black and white) can be found on line. This codex is fascinating for the role of a woman, Chimalma, as a teomama (deity-bearer). She carried Huitzilopochtli in her shawl. The scene below shows two women following the foot-printed path. Is that a walking stick or a staff of authority held by the woman in the lead? 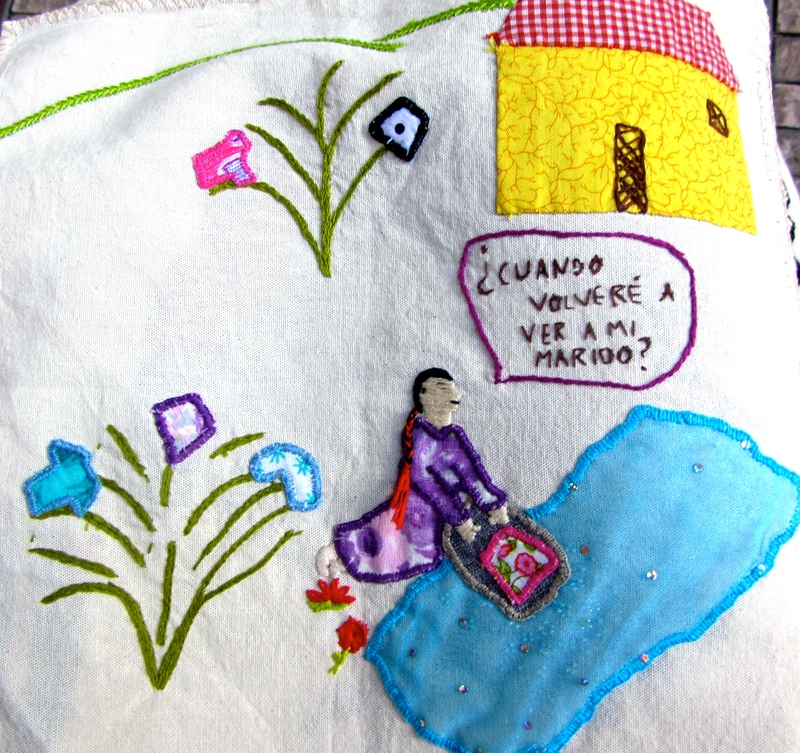 Migration scene showing the mountainous region near Chicomoztoc, and women with shawls full of important cultural objects. 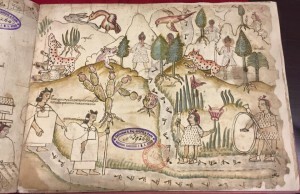 From the Codex Azcatitlan, housed at the National Library in Paris. Posted to Facebook in March 2015. In looking closely at the details, it would be difficult to miss the blue-purple and red stamps that appear on every page. The French collectors and librarians wanted to be sure we all knew this manuscript was theirs. This colonialist policy lives on, unfortunately. But at least images are finally becoming accessible, and one does not necessarily have to travel to France to see one’s own cultural heritage (except first-hand, which is an amazing experience, of course). 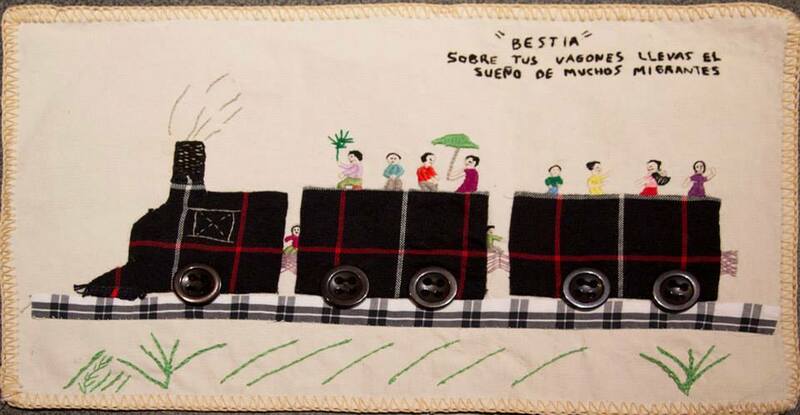 Under the recent encouragement of some women from outside the community, the women of Tanivet are telling their stories in appliqué and embroidery, sometimes putting such pieces together as quilts. In the piece above, the girls was frightened that the group with which she was trying to cross the border would leave her behind. She eventually made it into the U.S. Her mother, who stayed in Tanivet, was very worried about her. 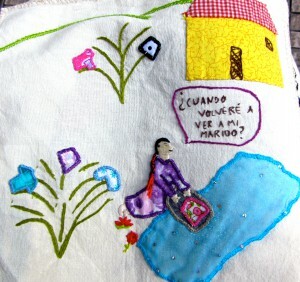 The speech bubble says “Dios ayúdame,” (God help me.) 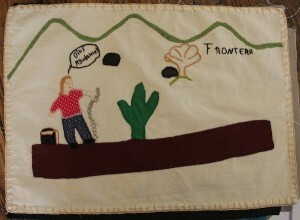 And the gloss near the zigzag line says, “Frontera,” (border). 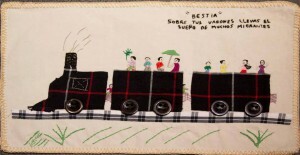 In this additional textile from Tanivet, above, the artist is speaking to the train, which she calls a “beast” (aka “horse”): “You carry on your wagons the dreams of many migrants.” And, below, a woman wonders whether she will ever see her husband again.